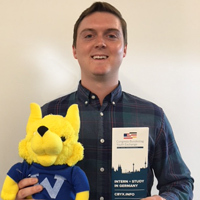 Jake Bennett, a Webster University student majoring in International Relations with a minor in German, has been awarded the coveted Congress-Bundestag Youth Exchange for Young Professionals (CBYX) fellowship. The immersion program, funded by the German Bundestag and U.S. Department of State, annually selects 75 American and 75 German young professionals between the ages of 18-24 to spend one year in each other’s countries, studying, interning, and living with hosts. 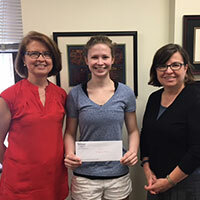 Samantha Womack has received the Summer 2018 St. Louis Stuttgart Sister Cities travel scholarship for students studying German and/or working in a German-speaking country. She is looking forward to learning more about German culture and working in Europe during the internship in the state of Baden-Wurtemberg close to Stuttgart, our sister city. 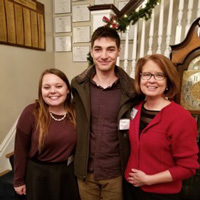 German language students in International Languages and Cultures attended the the German American Heritage Society party on Sunday, Dec. 10, in the Alumni House to entertain the members and enjoy some German specialties. The Society provides an annual scholarship for students going abroad to study the German language and be immersed in the culture. 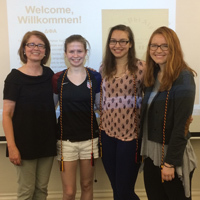 Another great year in the German program was capped by the induction of four students into Delta Phi Alpha, the national German Honor Society. Professor and program lead Paula Hanssen guided the initiation along with Fulbright teaching assistant, Tobias Michaelis. German majors Stephanie Werner and Gina Perhat have won the German American Heritage Society (GAHS) scholarship granted annually by the GAHS and St. Louis Stuttgart Sister Cities (SLSSC) for students going to Europe to take German classes through Webster University. Werner will to attend the Vienna campus, while Perhat will participate in an internship organized by the Dual University in Villingen-Schweningen, a suburb of Stuttgart. 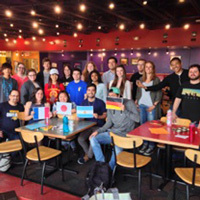 On April 21, teaching assistants from Argentina, France, Germany and Japan hosted a special trivia event in Marletto’s for around 20 students who had regularly attended their weekly individual language tables (Spanish, French, German, and Japanese) throughout the academic year, opportunities to practice speaking the language they are studying. Students studying Austrian cinema through Webster Vienna had a challenge. Their peers in German language class in St. Louis had a solution. Faculty members Holger Lang and Paula Hanssen conceived two courses that allowed students to enroll at their local campus while working in close collaboration to achieve a shared interdisciplinary goal. Their work creating subtitles for the Austrian film “April 1st 2000” taught them about language, cultural identity and perceptions of historical events. 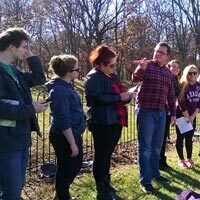 Sixteen students and three professors from Webster University spent April 8-9 immersed in German food, games, culture and language for the German Intensive Weekend. The weekend was an opportunity for German students to use the language they study in various situations and to build fluency. 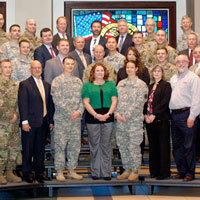 Colorado Springs' Margaret Reed accepted the Patriot Award for support of Guard and Reserve members, professor of German Paula Hanssen received the Friedrich Hecker Freedom Award from the German American Heritage Society of Saint Louis, and Fort Leavenworth's Katie Ervin was one of 16 participants in the National Security Roundtable program co-hosted by the U.S. Army Command and General Staff College’s School of Advanced Military Studies (SAMS) and the CGSC Foundation. 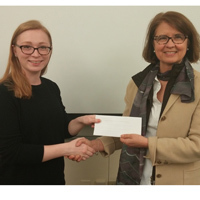 Webster University German major Sara Risker has won the $2,500 German American Heritage Society scholarship. She will study at Webster's Vienna campus in Spring II. Webster students who major or minor in German and will study abroad at the Vienna campus or Webster's partner in Trier, Germany, are encouraged to apply for next year. 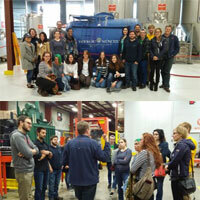 On the 25th anniversary of German re-unification, German language faculty and students at Webster University and at Saint Louis University met for an immersion experience, cooking authentic German meals together, watching a German film, and participating in a variety of activities that engaged students in cultural learning and exploration.